Mobile text marketing is one of the most cost effective ways for your business to reach its target customers. According to Ofcom statistics, more than 93% of UK adults own and regularly use a mobile phone, making SMS by far the most effective channel available for any business. Our mobile marketing service lets you send text messages in bulk to your target audience, your existing customers or your application's users. 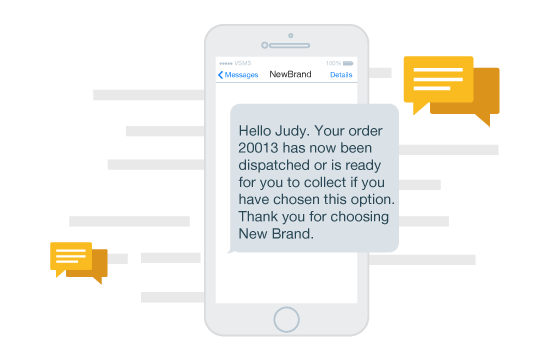 Within minutes of signing up, you can send out a text broadcast and deliver personalised, dynamic messages to each of your recipients. We work with businesses of all sizes throughout the UK, from small businesses eager to reach a new audience to large, established brands. Our value-focused pricing system means you'll pay less for each text message as your campaign grows in scale, improving your return on spend. Why should your business use mobile text marketing? Mobile phone marketing, also known as SMS marketing, is one of the most cost effective channels for reaching your target audience. With a single SMS, you can communicate with thousands of your customers or target customers throughout the UK. Since mobile phones are so widely used, SMS has a fantastic read rate that far exceeds that of email or traditional direct mail. Instead of waiting by as users delete your marketing emails, you can instantly reach a receptive, interested and profitable audience using mobile marketing. Mobile text marketing gives your business the opportunity to bring in new customers, increase return purchases and improve customer retention. Generate a measurable increase in sales in minutes using our secure, user friendly mobile marketing platform. How does our mobile marketing platform work? Voodoo SMS is built from the ground up to make creating and executing your mobile marketing campaign simple. With our unique value-based pricing system, you can send a small number of messages to your target audience or deliver millions of messages with fantastic bulk pricing. Starting your first mobile SMS marketing campaign is simple. Simply upload or create your list of recipients. Then, create your sender profile. Once you've completed these two steps, write your first text message and deliver instantly or schedule your campaign for the perfect delivery time. Using Voodoo SMS, you can schedule your message for a specific date to attract customers at the best possible time, or even drip deliver your messages in small blocks to make it as easy as possible for your sales and customer service teams to manage your campaign's response. Our service is designed to easily integrate with your application or database to send customised messages. Using Voodoo SMS, you can create dynamic texts (texts with custom fields such as a user's name or other data that generate the highest response rates). We offer a mobile text marketing API that makes connecting your application with your audience quick and simple. You can set up and launch your campaign in minutes, even if you don't think you're a 'technical' person. Create your account now and start sending dynamic, effective text messages to your audience for as little as 1.74p per credit. Our user friendly system and affordable pricing make it easier than it’s ever been before for your business to start a profitable mobile marketing campaign.